Why do industrial concrete pavements cracks and degrade? Join our #StructuralWhyFile to find out how to improve your chances of a top quality industrial concrete slab in #Australia. G’day. It’s Matt Cornell from Cornell Engineers. Today we’re going to have a quick look at an external concrete slab – a driveway slab – and have a look at some failures that are pretty common and I’ll give you a couple pointers on how to avoid them. So here we are let’s start with this one. This crack looks like a shrinkage crack and shrinkage cracks occur in the early days of a concrete slabs life – probably in the first one to four days and they occur when the concrete shrinks, loses volume and gets smaller in volume, before the concrete has enough strength to resist the tensile forces. 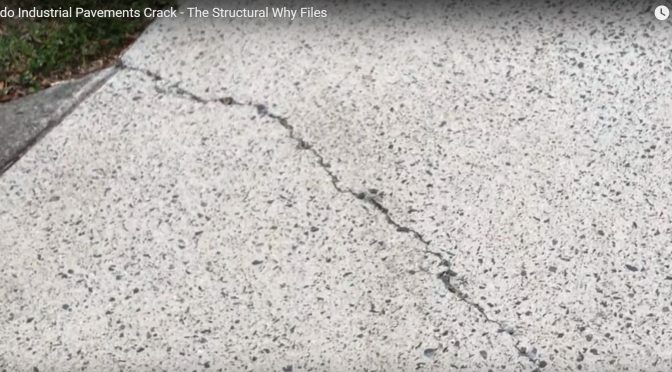 So the crack forms at at stressed locations, in this case there was another piece of concrete against it and would have propagated over its life. It isn’t going to get any worse. The best way to avoid these types of cracks is to place extra reinforcement at stress locations. So a couple of extra bars across the perpendicular to the direction of the crack would have kept that crack closed or at least a little bit more controlled. So moving on now and we’re looking at some abraded concrete. See how the stones in the cement matrix of the concrete matrix have been exposed which probably means that the surface has been abraded away by the wheel traffic or weathering or both leaving the fine stones and exposing them to so that you can see them. So probable cause of this is either a weak surface the cement matrix was water soft or had too much water in the in the cement matrix at the surface and that decreased the strength of the concrete layer on top and allowing it to be abraded by the wheel traffic. Moving back up to here so this next crack is an interesting one. See how it’s right beside a sawn line that – the straight line is a saw cut line in the concrete and there’s a crack right beside it. So in this case this is still a shrinkage crack the purpose of that sawn joint was to avoid this crack forming or to relieve the stresses in the concrete that caused this crack to form. So what has actually happened is the sawn joint has been placed way too late. Even if it had been placed the next day after the concrete was poured it’s likely that the sawn joint had have been placed way too late so it really should have been placed in the first six to eighteen hours after the concrete was poured. So now we see some more abraded concrete – the surface layer is lost and the stones are very well exposed. Coming up now to a different kind of crack again so, well actually, it’s the same kind of crack because it’s another shrinkage crack. So cracks that propagate from changes in shape of concrete or corners where cutouts were placed in the concrete for the grated are prime examples for concrete to shrink in two directions away and the stress buildup is accentuated at the corner of the grated and causes it to crack in another location where extra reinforcement should have been placed in the concrete. Moving on and you can just make out a pattern of rectangular shaped things on that patch of concrete back there but we’ll come back to that. So across another control joint. This crack in the middle of the driveway right down the centre of the driveway is again another example of shrinkage cracking. So this tells us that perhaps this is where the concreters should have put another control joint – another sawn joint where the crack was positioned. In this case, unlike the front crack which was right beside a control, a control joint hasn’t been placed in this location in the middle of the driveway and a crack has formed there anyway. Some more control joints more control joints and more cracks just in the middle of slab panels. So this rectangular section of straight line cracks is again another sample of cracks but these are not shrinkage cracks. Well in actual fact they are shrinkage cracks they actually known as plastic shrinkage cracks. So in this case the concrete has actually settled, maybe been under-compacted around these locations. The cracks are formed as the concrete slumped and hung over the top of the reinforcement so the cracks have opened up again in the early days of the concrete slab so hasn’t really affected the extra life for long age or the longevity of the concrete but nevertheless this concrete has got these cracks showing up and that’s why in this case. And then finally we come to a failed corner joint and I say it’s failed because there’s cracks in each corner – just about each corner on three of the four corners so this is not so much a concreting error as it is an error by the engineer the design engineer the concrete inspector perhaps to instruct the concreter on how to locate dowels – reinforcement across these joints. The cracks have probably formed after the sawn joints in this case so there has been shrinkage after the concrete was placed after the saw joints were placed across these joints. In industrial to light commercial slabs, there are often dowels. They help keep the concrete slabs level as they open up as the control joints do what they’re supposed to do concrete opens up at those joints if you don’t have dowels there you don’t have load transfer and the slabs can misalign. So these slabs are nicely aligned but the concrete the two-many dowels across the corner in both directions have locked up the concrete. The concrete has still shrunk but it’s the shrinking forces and the dowels have caused the corners to crack. So there you have it in quite a small section of concrete really we’ve seen quite a few different types of concrete failure. We’ve seen scabbling of the concrete from a weak concrete surface. We’ve seen control joints failing because they are either placed too late or dowels being placed across them in both both directions. We’ve seen plastic shrinkage cracks which were those parallel sort of rectangular cracks that where the concrete was hung over the top of the concrete and we’ve seen that this concrete slab really didn’t have enough control joints in it because of the cracks that are formed in the middle of the concrete panels. So that concludes our session on industrial concrete slabs light commercial and light industrial concrete slabs, how they crack and what can be done to prevent that cracking and some of the other failures that we observed. A lot of the blame has been placed on the concreters but in actual fact construction, concrete construction is a combined effort. Concreters obviously have a large part to play in it but the design engineer, the inspector that inspects the concrete all these people play a part and need to work together to provide top quality concrete slabs.